In this article we will instruct you how to remove old grout without expensive tools. You can remove old grout with very very simple tools you can see around your house. When remodeling a bathroom or kitchen, the hardest part can be removing the grout from pre-existing tile. Grout is made from water, cement and sand, which hardens over time to form a rock-like material. The strength of grout is what makes tile so highly desired, as it prevents the tile from shifting. Learning how to remove grout can save you a lot of money that you would otherwise have to pay to a contractor. Get the necessary tools. 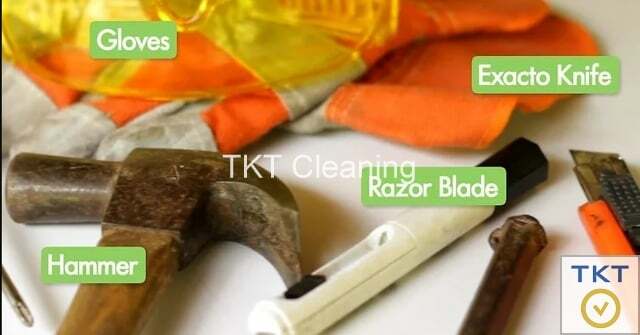 There are a number of tools which you can use to remove the grout. Those you choose will depend on how much money you wish to spend, how much and which type of grout you need to remove, and how often you intend to remove grout. You can use power tools. There are a variety of tools, called grout removal tools or re-grout tools, which will help you remove grout quickly and with much less effort. These are helpful if you have a large amount of grout to remove or remove grout often. You can use manual tools as well. 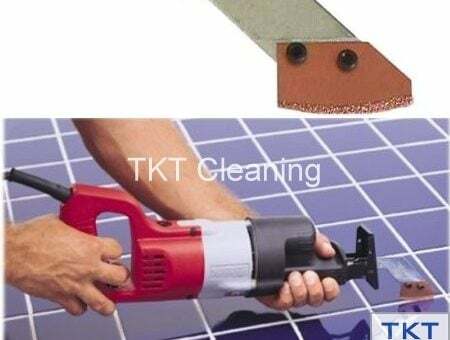 If you for some reason cannot use power tools but find that you have a reasonable amount of grout to remove, use a manual grout removal tool. This will look like a small trowel. If you only have a small amount of grout to remove or it is something soft like rubber grout, you can use a standard razor blade, like an exacto knife or a utility knife. If you are planning to keep the tiles and removing just the grout, cover the edges of each tile with painter’s tape. Cover the surfaces of the appliances you are planning to keep. As the grout is removed, flying debris can cause damage. Drape a large blanket or drop cloth over the appliances, making sure they are fully covered. If necessary, use tape to secure the edges of the protective covering and make sure to cover drains completely. Don protective clothing before starting the grout removal process. This should include safety glasses, dust mask and cut resistant gloves. For the purpose of comfort, consider wearing knee pads, as it can take a while to remove grout. Make sure to wear pants and boots as well. Make the center incision. Make an incision down the middle of each grout line using a grout saw, preferably one with a carbide blade. Do this to all the grout lines that you want to remove. Remove the grout. Remove the grout from between the pieces of tile with a grout scraper, using the incision as a starting point. Insert the triangular tip of the grout scraper into the incision you made with the grout saw. Apply firm pressure and drag the scraper along the grout line about the length of one tile, but be very careful to avoid scraping the tile. Lift out the grout scraper, return to the starting point and repeat the process until you have removed all the grout in that area. If you do not have a grout scraper, use a small, cold chisel and hammer or a knife blade. Angle the chisel away from the edge of the tile and tap if with the hammer until the grout is freed from the floor and edges of the tile. Finish the edges. Clean up the edges of the tile by chipping out any remaining grout remnants. Hold the chisel so that it is parallel to the floor and the cutting edge of the chisel is touching the edge of the tile. Lightly tap the end of the chisel with the hammer until the grout is loosened. Sweep up the broken pieces of grout from between the crevices using a dust broom or a shop vacuum. Remove tape and clean grout lines. Peel off the painter’s tape from the edge of the tile, then wash out the grout lines with soap and water. You may need a scouring pad to scrub away any remaining grout from the edges of the tile. Gently scrub the edges of the tile until the grout has been completely removed. Clean the tile. Wipe down the tile immediately if you are planning on keeping it, and then buff the area out a few times. Grout residue can quickly harden onto the tile, making it difficult to remove without damage. Fill a spray bottle with half vinegar and half water. Spray the tile and allow the solution to sit for a couple of minutes before wiping it away with a clean cloth. 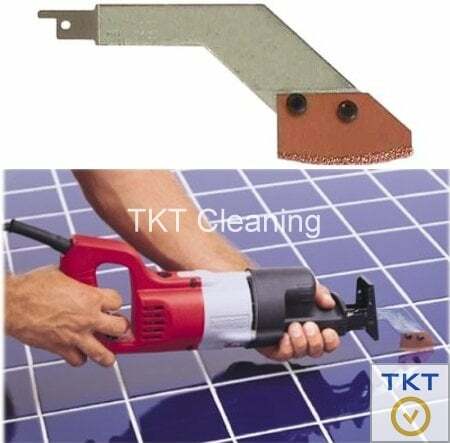 Base on this article TKT Cleaning do hop that you could remove grout by yourself with very simple tool.